A week before FIFA's presidential elections, another evil-smelling troll has escaped from the basement of Sepp Blatter's Swiss chalet. The current source of horror: Mohamed bin Hammam, Blatter's rival in the elections, was charged yesterday with offering bribes to members of the Caribbean Football Union to secure votes. Now FIFA's "ethics" committee will conduct an investigation into Bin Hammam, provided such a thing is even possible in the week prior to the election. FIFA is beyond comical at this point. It's a political farce beyond anything that Tammany Hall could dream up. To simplify the backstory to the latest scandal: CONCACAF president Jack Warner has been a Blatter loyalist for a long time. He organized the meeting at which Bin Hammam allegedly offered bribes. 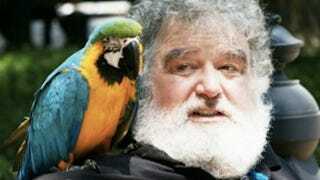 Chuck Blazer (see photo above, not the parrot) has also been pals with Warner for many years. Blazer is the CONCACAF general secretary and the lone American on FIFA's powerful executive committee. But Blazer is also one of Blatter's confederates, and when he found out about the alleged bribes, he reported Warner and Bin Hammam to FIFA. Thus concludes the straightforward account, which only a gull would swallow. The palace intrigue is very different. Did Blazer sacrifice Warner to smear Bin Hammam for Blatter? Did it have anything to do with Qatar's successful World Cup bid, which was spearheaded by Bin Hammam and has since been tainted by separate bribery allegations? Even if you're not a soccer fan, this is compelling drama. After all, we're talking about how a tiny cadre of beady eyed graft jobbers controls $1 billion in annual revenue and the direction of the world's most popular sport. Some media are delving deeper into the nuance. Warner is a key figure at FIFA, so adept at gathering votes and so good at making money that Blatter has long taken a lenient view toward the Trinidad and Tobago man's long list of reported indiscretions. Warner was let off with a slap on the wrist after he was charged in a ticket-reselling scheme, but he has been dogged by investigations and allegations - most famously those leveled by Andrew Jennings and the BBC last year. Prior to the World Cup bids, he was said to have promised his vote to England then reneged. Last month, he was named on the floor of Parliament by Lord Treisman as requesting a $4 million bribe for his vote. Warner laughed all those allegations off. Blazer, the only American on the ExCo, is wildly underestimated. His candor and exaggerated manners - he is host to a gleefully funny website and Twitter account - have charmed reporters worldwide, but conceal one of the keenest political minds in the sport. He has worked with Warner for decades, but was known to be deeply upset over the handling of the World Cup bid process. The fact that he is the man behind the investigation has long-time FIFA observers guessing whether he is truly fed up or has seen a political opening. Warner, a former history teacher from Rio Claro, a small town on the Atlantic side of the island of Trinidad, has been a survivor not least because his powerbase is so strong. Under his stewardship, Concacaf has grown rich – although that applies to most confederations across the same period – and so has consistently done as he wishes. The region's 35 votes in the Fifa elections, out of 208, are usually delivered en bloc and they have previously gone in Blatter's favour. It was expected that the Swiss incumbent would be on the receiving end again, with Concacaf following Uefa and the African confederation in declaring for Blatter. They were expected to do so during their congress in Miami earlier this month – where Warner was unanimously re-elected as president for another four years – but there was no such statement. A week later it was at a meeting of the Caribbean Football Union that Bin Hammam and Warner are now accused of offering gifts in return for votes. [T]he initial alarm was raised by one Caribbean football official who was offered but refused cash to finance football development projects in their country. Following the meeting of the 30 members of the Caribbean Football Union (CFU) on 10 and 11 May in Trinidad - a meeting where Bin Hammam presented his case to be president - this anonymous whistleblower took his concerns to the Confederation of North, Central American and Caribbean Association Football (Concacaf), the overall governing body for football in the region on May 15. The general secretary of that confederation is the American Chuck Blazer. Despite his long standing ties to Warner - who is Concacaf president and effectively his boss - Blazer called in Concacaf's outside legal counsel, John Collins, a partner at the Chicago based law firm Collins and Collins. It is understood he then conducted interviews with other officials from Caribbean FAs, some of whom signed sworn affidavits backing up what the first witness had told Concacaf. Photographic evidence of money changing hands is also reported to form part of the dossier put together by Collins. Presumably, we now get to listen to Blatter vow again that, if reelected, he'll sweep out the corruption that has metastasized under his watch. Which is like voting for George Bush to close the income gap. All that's left, really, is to bus in homeless black men with trick ballots.